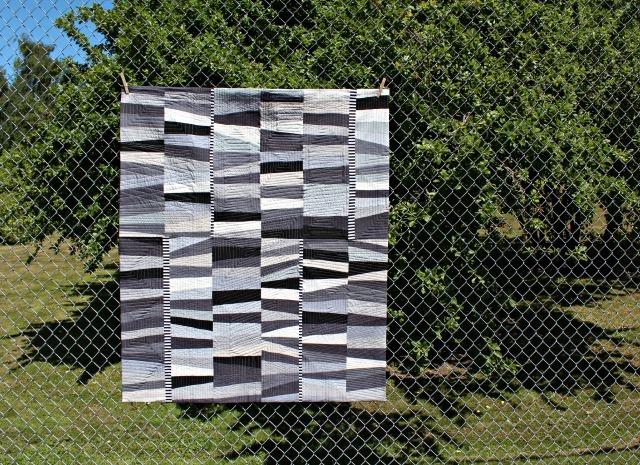 Monochrome was created explicitly for the August Quilt! Knit! Stitch! show in Portland, Oregon. This is my second year entering the challenge, last year getting into the show with ástərisk. When announced, this year's theme, Black to White, was another "oh dear, what will I do with that?!" just like last year's modern metallics challenge. But once I had an idea, I ran with it and really enjoyed myself. Fresh from Room Temp's "improv under the influence", the gradient of black to white seemed a good fit for the same technique, and I was anxious to try it again. Except I used the white very sparingly, only in the Michael Miller's Clown Stripe. The rest of the fabrics were solids from my stash, mostly Kaufman Konas. 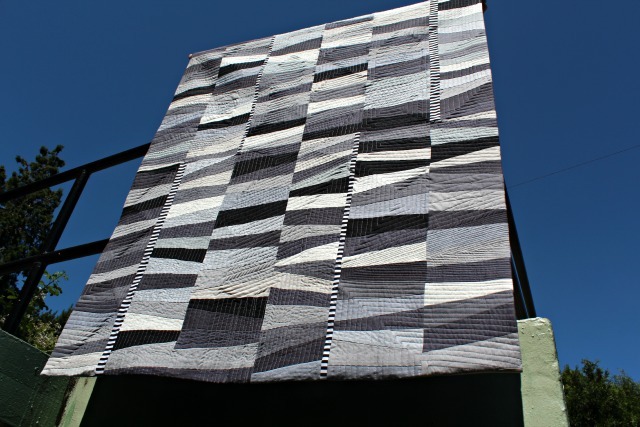 Rather than begin with 5" squares as in Krista Hennebury's original, I used 9", wanting to work with larger strips. 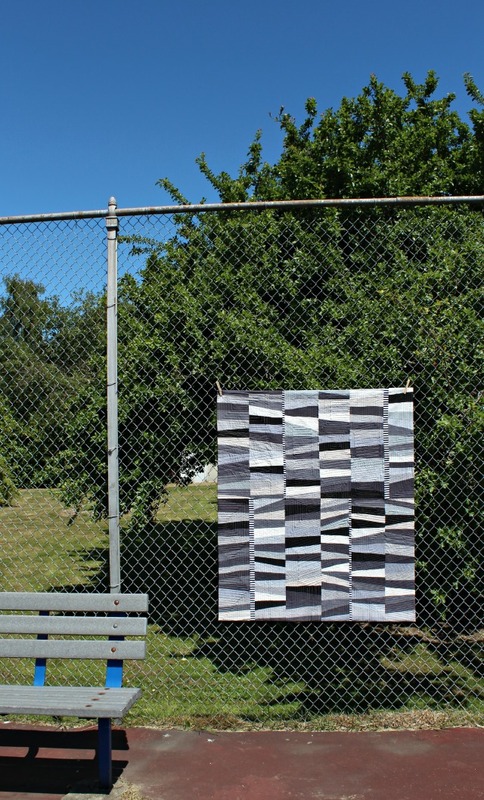 Backing is Jazz Jam by Jane Dixon for Andover Fabrics, and quilting was done with Aurifil 50wt #2600 (light gray) and #2605(medium gray) in straight-line spirals and echo-stitching in random areas. Again I used the quilt facing tutorial by Terry Aske Art Quilt Studio, and the finished quilt measures 45"x53". So there's my interpretation of 'Black to White' - I'll let you know if she makes it into the show! Love!!!! I didn't realize the scale so I'm glad to read about it here. Did you mark your sewing lines on the 9" squares? I have yet to try the technique on larger pieces. Good luck for the show! I really love this! The quilting is so perfect too! I really love those stipey strips! Good luck with your entry! I love this quilt!! Especially the striped piece. Beautiful! It's so very "you." The quilting is a perfect extra layer of depth! I just adore this!! Good luck!! X! Your quilt is beautiful and I hope the show is a success! What a great quilt Debbie. 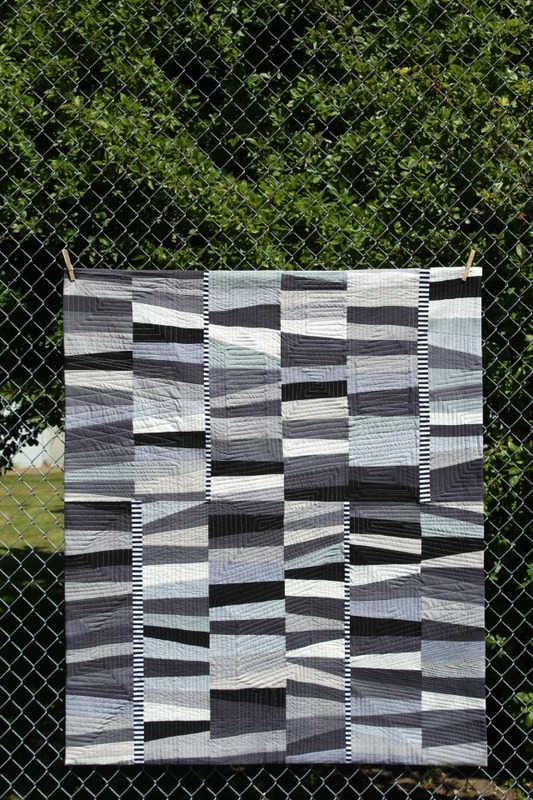 I just love that addition of striped fabric, so totally perfect for this quilt. Good luck at the show. I too love it! 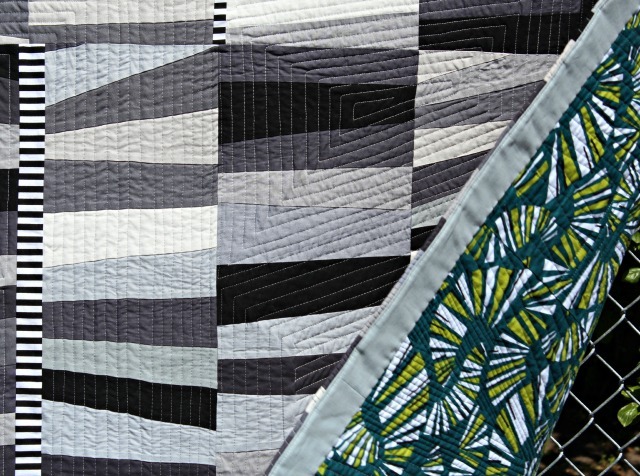 There is lots to look at in this quilt, and the quilting is a perfect compliment. Ack! this one is so good too!! This is really quite nice Debbie. I love the use of the stripe in select areas.I've had something similar in mind for a long time in terms of the slivers of stripes so maybe I'll get it started one of these days. Good luck getting it in the show.